Orange, and Los Angeles Counties! Unfortunately, driving on the road is unpredictable and accidents do happen. At The Paint Department, we have years of experience restoring and repairing RVs that have been damaged due to collisions. Our team will use manufacturer recommended parts to meet factory standards as close as possible. Allow us to provide you with our excellent and friendly repair services. The Paint Department offers on demand video, or photo updates of work being done on your RV. 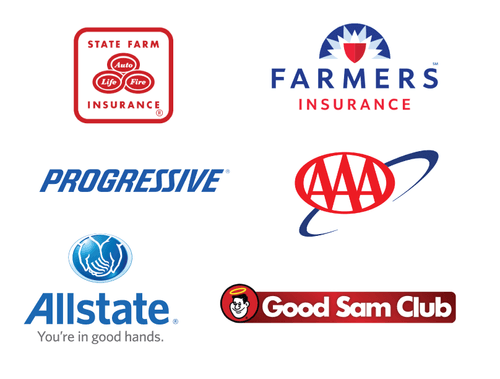 Working with all insurance companies. Offering free estimates on our work. Giving you the option of same-day appointments. 30 and 50 amp hook-ups provided for full-timers. Proudly standing behind all of our work. Offering a comprehensive set of services to meet all your repair needs. To learn how we can get your RV back on the road, give us a call at (800) 544-5033. From repairs to upgrades, we’re your trusted leader for all RV services. Take a look through our photo gallery and let our work speak for itself. Tell us more about the service you require to receive a free estimate today.